The basic characteristic of human life is that all things that breathe will lost strength, vitality and vigor at some point of time: all things would WILT. This is the law of life that cannot be avoided. And that is how we learn the word: from nature and its natural process of wilting. Plants wilt and the picture above depicts one such plant. 1. A wilted rose is like a jilted lover: missing its essence. 2. Old age brings with it the baggage of wilting. 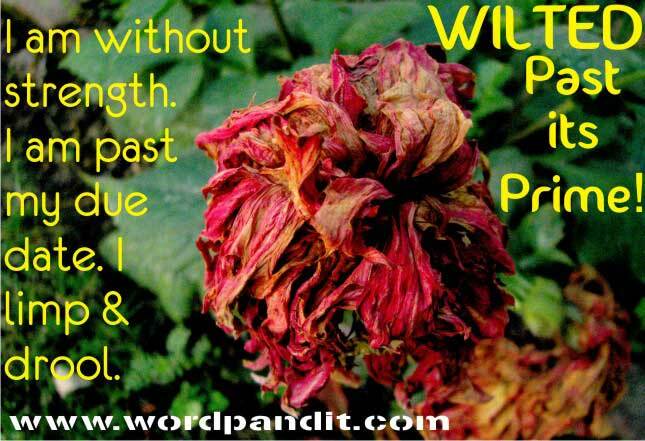 Can be remembered as Wilted=will+tired,when your will power is dead or tired,and hence wilted means to fatigue,to lose strength. Please edit will lost in the first line,it can be simply put as looses!